What sets an electrical wholesaler apart is often the simplest things, such as having the right products in stock or being able to locate then source hard-to-find specialist products or equipment. When these requirements occur on a daily basis, having staff with experience is essential. Supplying standard products is a given, says Kevin Pollock, but having in-depth knowledge at branch level and beyond to provide the most effective solution for any electrical installation is where Active Electrical Suppliers stands out. As Active’s general manager, Pollock says the comprehensive stock on show at any Active branch is only the starting point of what the company has available, and he invites new customers to engage with their local Active branch to see how the people running it can procure everything electrical to complete a job or a project. 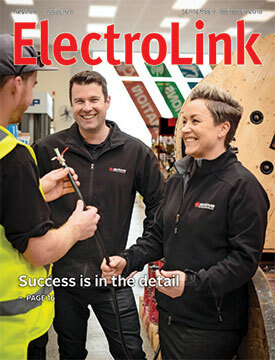 He says the growing Active network is a New Zealand-owned operation, committed to supporting local electrical contractors and industrial electricians with a pragmatic, helpful approach driven by its local branch managers. “The Active business is strongly focused on its branches together with the people managing and running them. There is no corporate machine or entrenched bureaucracy to interfere in the operation of the branches and how they work with local customers. One year out of his apprenticeship and in the midst of the Global Financial Crisis, Ben Lyon started his electrical contracting business. The business prospered despite the recession, and at its peak Lyon says he was employing up to 60 staff on open tender projects around Auckland. But his own crisis came in 2017 when his company, Lyon Electrical Ltd, ran into difficulties on a high-rise project the builder was struggling to complete. Lyon believes his company began to lose about $100,000 a month, and the other work they had on was insufficient to cover the losses. On August 2 Lyon Electrical went into liquidation. Lyon says with no trust protection, everything he had was sold at a loss, and the past year has been challenging for him and his family. Lyon says he regrets the cost of the failure to his staff, clients and creditors and wants to clear the air on the circumstances surrounding the company’s failure, which has been attributed to the dodgy TPS cable he imported at the time through his other company Generation Cables Ltd. In the January 2014 issue of ElectroLink, electrical contractor Dave Burt warned of the pitfalls of inadequately funded growth as the construction industry started to expand. To prepare for a potential downturn today, he now offers the following advice. It’s almost five years since I gave my view on growing your business to take advantage of a burgeoning construction boom after years of tough trading conditions induced by the GFC; the things to watch out for and be aware of. So, have you made your fortune? I hope so. If history is to be believed, like all cycles the glory days will come to an end, but maybe not as dramatically as the previous boom. Trading conditions will become tougher and that is, and will be, a fact. The cranes will disappear and we will be forced to compete over the scraps, and restructure our businesses to meet the market. I don’t see any immediate need to panic – the construction sector is still strong – but my advice is to plan for it and be aware of things out there that have the potential to bite hard. Before I give my view on what those might be, I want to make some observations on this construction boom that is unique to previous ones. As electricity supply issues surrounding the increasing uptake of electric vehicles are now being aired, there has yet to be a definitive study on the impact of EV loads on a home and how these loads might affect electrical resilience, safety, domestic load management and the wiring design rules required to ensure a barrier-free EV future for consumers. But there is a growing body of research coming from the traditional supply end of the market, such as a study produced by Concept Consulting for three network companies and published in March this year. Concept Consulting believes that current electricity supply arrangements will frustrate realisation of the benefits offered by EVs, and will also result in EV uptake causing unnecessary costs. For those who believe that human society should be reordered to achieve net-zero greenhouse gas emissions, the report will be welcome. It identifies the large-scale uptake of low emission vehicles as the single most important element required to meet this objective. But standing in the way of achieving it are current electricity ‘flat’ pricing approaches will result in higher costs and emissions. Concept says over 95 percent of homes are on flat $/kWh prices which don’t vary across the day, and this will affect charging behaviour and result in unnecessary costs being incurred. Deciding whether it is safe to enter and work in potentially hazardous or toxic atmospheres is now easier with the updating of the joint standard covering electrical equipment for detecting oxygen and other gases and vapours at toxic levels. 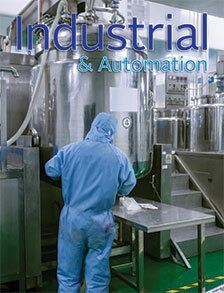 AS/NZS 4641:2018 provides for general requirements and test methods to help carry out risk assessments more effectively, and follows on from the release of AS/NZS 2290.3:2018 earlier in the year. This latter standard covers electrical equipment for coal mines and addresses inspection and maintenance procedures utilising gas detecting and monitoring equipment. While the purpose of AS/NZS 2290.3:2018 is to provide guidance on the use of gas detection equipment in mines for the safety of coal miners, the standard is primarily focused on preventing explosions, says hazardous area expert Garry House. He says the new edition of AS/NZS 4641:2018 extends this protection available to miners and to other people working in hazardous atmospheres by also addressing oxygen levels and the presence of toxic gases that are harmful to health. House serves on the standards committee responsible for AS/NZS 4641:2018 – an upgrade of the 2007 edition. He says there are many standards designed to address aspects of hazardous areas and this new edition adds to the body of knowledge. 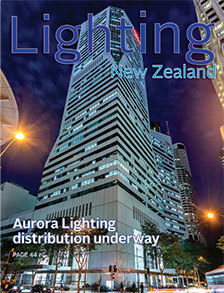 Announcing the new partnership in July, Aurora Lighting’s Australia and New Zealand managing director, Fred Nimarota, says Aurora will continue to build its presence in New Zealand while working closely with ESC in support of electrical wholesalers and contractors. Nimarota says, because of the breadth of the Aurora ranges and the strength of the company’s two brands, Aurora and Enlite, Aurora Lighting will also be investing in the development of services for lighting designers and specifiers in the project market. The lighting portfolio is entirely LED with all Aurora Lighting products being designed and manufactured in the company’s own production facilities in the UK and in China. With a growing world population there are more and more people to feed. As a result, there is a demand for more efficient methods of food production, and especially for systems that minimise environmental effects. One system that’s attracting a lot of research and development is indoor horticulture and a lot of attention is going into the lighting needed for successful indoor growing. Horticultural lighting is a rapidly-expanding market, especially with the introduction of specialised LED light sources. Plants need light in order to grow. The sun provides a full spectrum of light from infrared (up to 700 nanometers in wavelength) through to ultraviolet light (from 400 nanometers). In between infra red and ultra violet is the visible light portion of the spectrum which, even though it appears white to us, is literally made up of the colours of the rainbow. Most plants need light from both the visible and invisible parts of the spectrum, with different wavelengths of sunlight meeting different needs of the plant, although this differs from one plant variety to the next. What’s up with flag lighting? When road lighting people talk about flag lighting they don’t mean lighting flag poles – they’re referring to a road light placed at an isolated rural intersection to flag its presence at night. However, flag lighting does not appear to reduce loss-of-control accidents involving single vehicles, a statistic that might say more about human behaviour than it does about road lighting. Unlit rural roads at night are very dark places and traffic on them may be travelling at open road speeds. A motorist may have no idea that there is a side road ahead. The road lighting standard AS/NZS 1158.1.1:2005 says flag lighting is not necessarily designed to light up the intersection itself; rather it’s there “to alert approaching motorists to the presence of the intersection from a safe distance away”.